Bithynia, Kios. ca. 350 to 300 BC. Silver hemidrachm. Size : 13.2 x 15.7 mm. Weight : 2.46 grams. Grade : VF, slightly double struck reverse. 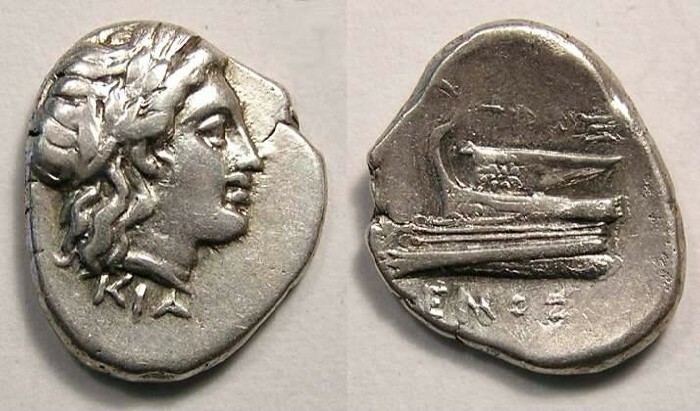 Obverse : Head of Apollo right KIA below. Reverse : Prow of a galley right, with the magistrates name below, but the name is difficult to read because of the double strike. What is above the prow appears to be GIOX and below the prow ENOS.